Segment makes it easy to send your data to Google Analytics (and lots of other destinations). Once you've tracked your data through our open source libraries we'll translate and route your data to Google Analytics in the format they understand. Learn more about how to use Google Analytics with Segment. Your Google Analytics real-time dashboard will start showing live concurrent visitors. Any iOS and Android apps running our mobile libraries will start sending data to Google Analytics. New settings will take up to an hour to propagate to all of your existing users.Or if you just added the iOS or Android library to your app code, it’ll be instantaneous! Google Analytics will start automatically collecting data on your site or mobile app. It takes several hours for Google to process this data and add it to your reports, but you should still see events showing up in their real-time events dashboard. Segment supports Google Analytics client-side and the server-side tracking, in addition to mobile app analytics for iOS and Android. These docs will only cover GA Universal features, since the Classic tracking method has been depreciated. When you call page, we send a pageview to Google Analytics. Pageviews can be sent from the browser or through any of our server-side libraries. The resulting page event name in Google Analytics will correspond to the fullName of your page event. fullName consists of a combination of the category and name parameters. For example, analytics.page('Home'); would produce a Home page event in GA’s dashboard, whereas analytics.page('Retail Page', 'Home'); would produce an event called Retail Page Home. Note that when sending page views from one of Segment’s server-side libraries, a url property is required. Otherwise, Google Analytics will silently reject your page event. When you call screen in your mobile app, we send a screen view to Google Analytics for mobile apps. If you are sending a screen call server-side, you must pass in an application name through Segment’s context.app.name object or Google will reject your event. If you’ve set an application name in your Android or iOS project, Segment will grab the name and pass context.app.name automatically. For iOS, Segment collects your project’s infoDictionary and uses whatever name you’ve set there. You can see Segment’s iOS Library code in action, and you can read more about how to set the display name for your iOS app. In some cases, like using Google Analytics to track search queries, you may want to pass the whole URL with query string to Google Analytics. To make that happen check the Include the Query String in Pageviews box under Advanced Options in the Google Analytics sheet on the Segment destinations catalog. It is against Google’s terms of service to pass Personally Identifiable Information (PII) to your Google Analytics reporting interface. For that reason Segment will never pass anything from an identify call to Google unless you specifically tell us to. You can read about Google’s best practices for avoiding this here. Google Analytics Universal tracking method allows you to set a user ID for your identified visitors. Read more here. To use this feature you must enable User-ID in your Google Analytics property and create a User-ID view, read more here. If you want to pass the id from your identify calls to Google Analytics - enable Send User-ID to GA in your Advanced Google Analytics settings on the Segment destinations catalog. In this example we will set the User-ID to 12345 for Google Analytics, but we won’t share the email or name traits with Google. If you are passing an email, phone number, full name or other PII as the id in identify do not use this feature. That is against the Google Analytics terms of service and your account could be suspended. Google Analytics has multiple scopes for each custom dimensions: hit (synonymous with events), session, user, product (required enhanced ecommerce to be enabled). Our client-side analytics.js library supports both hit and product scoped custom dimensions. Our mobile libraries (Android and iOS) support only hit scoped custom dimensions. We do not currently support session or user scoped custom dimenstions. Configuring Custom Dimensions: First, configure the Custom Dimensions in your Google Analytics admin page. Read how to set those up here. Once you are set up in Google Analytics, you are ready to map traits and properties to your custom dimensions. From your Segment Dashboard, open the destinations catalog and select the Google Analytics destination, then Advanced Options. Locate Custom Dimensions and declare the mapping. Note: A particular trait or property may only be mapped to a single Custom Dimension at a time. Once all your dimensions have been mapped, we will check user traits and properties in identify, track and page calls to see if they are defined as a dimension. If they are defined in your mapping, we will send that dimension to Google Analytics. Note: Traits in Identify calls that map to Custom Dimensions will only be recorded to Google Analytics when the next track or page call is fired from the browser. Continuing the example above, we can set the Gender trait with the value of Male, which maps to dimension9, and it will be passed to Google Analytics when we make the ‘Viewed History’ track call. If you are sending .identify() calls from your server side libraries or have Segment Cloud Apps that send back .identify() calls with enriched user traits, you can send that data to your GA account via custom dimensions and metrics. Unlike the client side destination which has the luxury of browsers and the global window ga tracker, for server side we will check your traits and your settings for custom dimension/metric mappings and send it with an explicit event. You can specify in the setting what you want this event action to be named. We will fallback to a default of ‘User Enriched’. Since event category is also required, you can specify which trait you want us to set this value as. For example, if you send a trait such as type, we will set the value of traits.type as the event category if defined and otherwise, we will fallback to ‘All’. NOTE: We will always mark this event as a Non Interaction hit. This is also only available if you are using Universal GA. Segment makes it simple to save your A/B testing versions to custom dimensions in Google Analytics. All you have to do is map an experiment to a custom dimension in the Google Analytics Advanced Options inside Segment. If you are using Cloud Mode or server-side Google Analytics destinations, you can also send this data automatically using our experiment_id, experiment_name, variation_id, and variation_name properties. If both an experiment and variation are defined, then this will send automatically. Note that we will use the ids over the names, if both exist (for example, sending experiment_id, experiment_name, and variation_name in a call will ultimately send experiment_id and variation_name). Remember: You’ll need to setup dimension13 inside of your Google Analytics Admin first as described at the top of this docs section. We’ll record a Google Analytics event whenever you make a track call. You can see your events inside Google Analytics under Behavior -> Events -> Overview. Keep reading for more details about the Google Analytics event category, action, label, value and how to populate them. For Event Value you can name the event property value or revenue. We recommend using value for client-side tracking and revenue for more accurate server-side revenue tracking. Calling it revenue is best if the event made you money directly. That way we can also pass the revenue data to other destinations you have enabled. To create an event with the nonInteraction flag just pass us an event property labeled nonInteraction with the value of 1. You can also set all events to be non-interactive by default in the Advanced Options. Segment supports Google Analytics basic e-commerce tracking across all our libraries. All you have to do is adhere to our e-commerce tracking API and we’ll record the appropriate data to Google Analytics. All of our e-commerce events are recommended, but not required. The only required event is Order Completed. For each order completed you must include an orderId, and for each product inside that order, you must include an id and name for each product. All other properties are optional. Without this step transactions will not show up in your reports. Segment supports Google Analytics Enhanced E-Commerce tracking across both our client-side (analytics.js, android-analytics, ios-analytics) and server-side destinations. Enhanced Ecommerce allows you to derive insights by combining impression data, product data, promotion data, and action data. This is required for product-scoped custom dimensions. To get started, you need only enable enhanced ecommerce and adhere to our standard e-commerce tracking API, and we’ll record the data to Google Analytics with their enhanced ecommerce API. Similar to regular e-commerce, the only required event is Order Completed. This call also must include an orderId and an array of products, each containing an id or name. For all events that include product details you must pass either name or product_id. For product_id we default to properties.product_id and fallback to properties.sku. Segment’s Android SDK v2.0.0 does not support properties.sku since no mapping to this property is available in Google’s latest SDK, so you must pass a product_id. All other properties are optional. The Refunded Order event also requires an orderId. 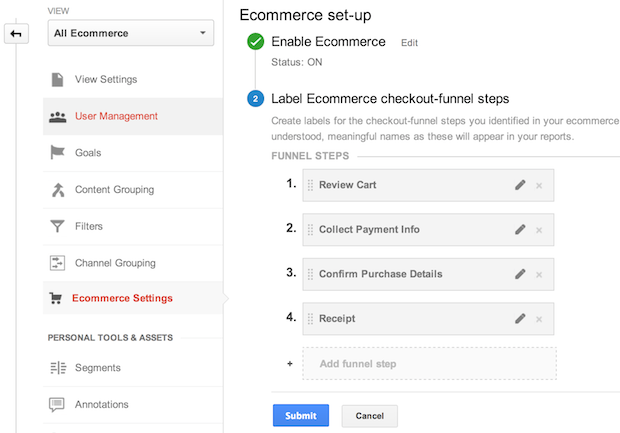 Lastly, you have to enable Enhanced Ecommerce in the Google Analytics destination settings. //you will need to provide either an empty shippingMethod or paymentMethod for the event to send. Note: shippingMethod and paymentMethod are semantic properties so if you want to send that information, please do so in this exact spelling! You can have as many or as few steps in the checkout funnel as you’d like. The 4 steps above merely serve as an example. Note that you’ll still need to track the Order Completed event per our standard e-commerce tracking API after you’ve tracked the checkout steps. Enhanced Ecommerce also allows you to collect impression information from users who have viewed or filtered through lists containing products. This allows you to collect information about which products have been viewed in a list, which filters/sorts have been applied to a list of search results, and the positions that each product had within that list. Product impressions are mapped to our ‘Product List Viewed’ and ‘Product List Filtered’ analytics.js events. You can find more information about the parameters and requirements here in our e-commerce tracking API. For refunds to work, you need to have enhanced e-commerce turned on. Segment supports Google Analytics mobile app analytics via our iOS and Android sources. For getting started with our mobile sources, check out the iOS and Android technical docs. When including Segment-GoogleAnalytics in your project, we bundle IDFA support by default. You can choose to exclude IDFA Support by specifying pod "Segment-GoogleAnalytics/Core". Doing this, we will only bundle the Segment and Core GA libraries, excluding GoogleIDFASupport. You’ll need to create a new Google Analytics property for your mobile app. You can’t mix website and mobile apps within the same Google Analytics property. You can however mix Android and iOS implementations of the same app, or many different builds of the same app inside the same property. The first thing you’ll want to do if you’re bundling the Segment-GoogleAnalytics SDK is to add your Mobile Tracking Id to your Google Analytics settings inside Segment. This ensures that data can flow from each user’s mobile device to Google Analytics. Otherwise, Segment won’t know where to send your data, and the events will be lost. When Will I See Data? If you already have an app deployed with the Segment library, and you just turned on Google Analytics mobile, it will take up to an hour for all your mobile users to refresh their Segment settings cache, and learn about the new service that you want to send to. After the settings cache refreshes, our library will automatically start sending data to Google Analytics. This allows you to perform custom actions with Google Analytics, such as user timings. When you track an event or pageview with one of our server-side libraries or HTTP API we will send it along to the Google Analytics REST API. You must include a server-side tracking ID in your Google Analytics destination settings or we won’t pass server-side events to Google Analytics. The tracking ID can be the same UA code as your regular property ID, or you can choose to send the server-side events to a separate Google Analytics property. Your servers also have access to this cookie, so they can re-use it when you send server-side events to Segment. If you don’t use the existing cookie Segment has to create a new one to make the server-side request to Google Analytics. When we create a new cookie the client-side and server-side events from the same user will look like two distinct visitors in Google Analytics. Pass your Google Analytics cookies to Segment (preferred). Use two Google Analytics profiles: one for client-side data and one for server-side data. Ignore the additional visitors generated by not passing the cookie. Universal Analytics (analytics.js) uses the clientId to keep track of unique visitors. If you want our server-side destination to use your user’s clientId, pass it to us in the context['Google Analytics'].clientId object. You must pass this value manually on every call as we do not store this value for you. If you do not pass this through, we look for the userId or anonymousId value and set it as the cid. By default, we won’t set the user-agent header. If you have your user’s user-agent server-side, you can send it to us using the context object. The context object is an optional argument supported by all of our server-side sources. Google Analytics uses the IP address of the HTTP request to determine the location of the visitor. This happens automatically for client-side and mobile tracking, but takes a little more work for server-side calls. For geo-location to work from a server-side call you’ll need to include the visitor’s ip in your .track() call. Your UTM params need to be passed in the context object in context.campaign. For Google Analytics campaign.name, campaign.source and campaign.medium all need to be sent together for things to show up in reports. The other two params (campaign.term and campaign.content) are both optional, but will be forwarded to GA if you send them to Segment. Check the box in the Advanced Options for Google Analytics inside of Segment. Google’s remarketing (The remarketing tag formerly known as Doubleclick) is used to tag visitors for remarketing campaigns. It is also used to identify demographic and interest data on visitors that is displayed in Demographic & Interest reports inside of Google Analytics. 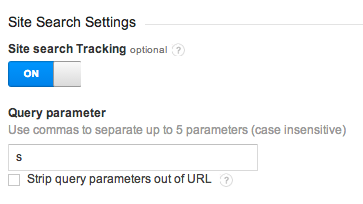 Turn this feature on by checking the box in your Google Analytics destination settings. Since remarketing is loaded through Segment Google Analytics will not be able to validate that the code is present on the page. Just click Skip validation and your data will start showing up within a few hours. This works automatically if you’re using the Universal tracking method. To track across sub-domains we recommend upgrading to universal if you haven’t already. Although Segment does not support loading multiple trackers through the destinations settings page (you will probably run into Google Analytics’s rate limits), you can load a 2nd tracker on the page manually. Note: Make sure this script is placed after your Segment snippet, ideally at the end of the head tag. After you create the second tracker, you probably want to use our .on() emitter to automatically send data to this separate Google Analytics instance based on when you make other Segment calls. The below code would trigger an event to Google Analytics when you make a Segment track call. Important: Keep in mind you will need to do all the data translation/properties mapping inside this .on() function before you send the event to Google Analytics like you see in our destination code. To do this server side, you can create a separate source in Segment, and within this source enter your GA credentials for the second tracker. This source can be your server-side source. From there, its easy to send data to multiple projects server-side, as you can see in this Node example you can initialize multiple instances of our library. The Google Analytics Cookie Domain Name setting allows you to specify the domain that the _ga cookie will be set on. By default the cookie is placed on the top level domain: domain.com. We default the Cookie Domain Name to auto, which automatically sets the cookie at the root domain level, which allows you to track across multiple sub-domains, but does not work on localhost. You can find this setting in your Google Analytics destination settings. If you need to test on localhost, but don’t need to track between multiple sub-domains, then you can set the domain to none. If you only want the cookie to persist on a single sub-domain, enter that sub-domain in the Cookie Domain Name field, like this: swingline.initech.com. In this case visitors to conclusions.initech.com or initech.com will not be tracked. For more information on Google Analytics cookies and domains name see Google’s docs on the subject. Segment supports Google Analytics tracking across multiple top level domains, but it requires a bit of work from you. There are two ways to track visitors across domains. If you’re identifying your users with a User-ID cross-domain tracking becomes simple. All you have to do is make sure you identify your users on each domain and Google will merge those users together as one. The only problem with this approach is that it only works for identified users, anonymous visitor sessions will not be maintained across domains. When a visitor comes to your website, domain1.com, Google Analytics sets a first-party cookie that represents that user. That cookie looks like 182119591.1441315536, and is tied to domain1.com (making it a first party cookie). To make things easy Segment enables allowLinker by default so all you need to do is run these two functions with any domains you want to track across to in the second call above. You’ll have to send the clientId as described in the Google Analytics Domain Guide to get this setup. When someone searches on your site, the search term they used must be added to the URL query, like this: domain.com?s=coconuts. The key (“s” in this case) can be any letter or string of letters. In your Segment source destinations catalog open the Google Analytics settings, click to the Advanced Options tab, scroll down and make sure the box is checked for Include the Querystring in Page Views. When you use Segment to load Google Analytics, our script loads the Google Analytics script. If you use Google Analytics as the verification option in Google Webmaster Tools, you’ll need to switch to the Meta tags verification option instead. This will require you to find the <meta name=google-site-verification" ..> tag in Webmaster Tools and place it in your master HTML template. We take care of tracking the canonical URL to Google Analytics for you automatically. As long as there is a <meta rel="canonical"> tag on your page, we’ll make sure Google Analytics gets the right canonical URL from it. If you’d like to integrate with Google Analytics’ Optimize plugin, all you have to do is insert your Optimize Container ID in your destination settings and we will require the plugin when we initialize GA! Note: Please make sure your Container ID is spelled correctly and that your Optimize container is ENABLED w/in Google. Otherwise, your GA destination will silently error out every time you try to make any tracking calls. You may, however, want to deploy page hiding to prevent the page from flashing / flickering when the A/B test is loaded. This is recommended by Google. This code must be added manually by customers since it needs to load synchronously. Note that the Optimize container ID must be included in this snippet too. They both allow you to track custom data properties in Google Analytics. However, Metrics are for event properties with a numeric data type and Dimensions are for event properties with a string data type. Google Analytics doesn’t process their data in real-time in most of their reports. The easiest way to see if the data is streaming in is to check the Real-Time reports inside Google Analytics. If you see events in your real-time reports, but they never show up in other reports that is usually due to a filter you have applied. You can see your active filters inside Google Analytics by clicking on Admin then under your View on the right click on Filters. Google Analytics’s default reporting time frame is a month ago to yesterday. You’ll need to adjust it from a month ago to today’s date to see today’s already processed events. If your site uses https://, please go to your Google Analytics property settings page and change your Site URL to use the https:// protocol. Using Segment won’t affect your bounce rates in Google Analytics. If you see your bounce rates drop after installing Segment make sure you don’t have multiple copies of our snippet on your page. Also be sure you’re not calling page more than once when the page loads. If you call track on page load make sure to set nonInteraction to 1. You can also set all events to be non-interactive by default in Advanced Options. Read more in our non-interaction events docs. If you are seeing traffic from Boardman or see Segment as the browser, this is most likely because you are sending calls to Google Analytics from the server side (our AWS servers reside in Boardman, Oregon). In order to prevent the Boardman issue, you would have to manually pass the IP information in the context object from the server. Google Analytics requires the context.app.name passed in each call. Since the analytics-ios SDK pulls it in locally, you may see the error “context.app.name required” if you are not providing a CFBundleDisplayName within your Info.plist file. To resolve this error, ensure you provide a localized info dictionary as outlined here. For client side libraries. Read more about anonymizing IP addresses from the Google support documentation. Important: When creating your Google Analytics profile, you can choose between Classic and Universal Analytics. After March 2013, new profiles default to Universal, while earlier ones are Classic. An easy test: if you see _gaq.push in your code you’re using Classic, so enable this. Enter a property name on the left. Choose the Google Analytics content grouping you want on the right. Google Analytics only accepts numbered content groupings (e.g. contentGrouping3). When you use analytics.page(name, properties) with custom properties, we’ll use the value of the property you designate as the value of the specified content grouping. Because Google Analytics cannot accept arbitrary data about users or events, when you use analytics.identify(userId, traits) with custom traits or analytics.track('event', properties) with custom properties, you need to map those traits and properties to Google Analytics custom dimensions if you want them to be sent to GA. Enter a trait or property name on the left. Choose the Google Analytics dimension you want on the right. Google Analytics only accepts numbered dimensions (e.g. dimension3). We suggest using user-scoped dimensions for trait mappings and hit-scoped dimensions for properties Contact us if you need help! Only data sent from visitors on this domain will be recorded. By default Google Analytics automatically resolves the domain name, so you should leave this blank unless you know you want otherwise! This option is useful if you need to ignore data from other domains, or explicitly set the domain of your Google Analytics cookie. This is known as Override Domain Name in GA Classic. If you are testing locally, you can set the domain to none. Read more about this setting in our docs. Remarketing, Display Ads and Demographic Reports. Works with both Universal and Classic tracking methods. If you are sending .identify() calls from your server side libraries or have Segment Cloud Apps that send back .identify() calls with enriched user traits, you can send that data to your GA account via custom dimensions and metrics. Unlike the client side integration which has the luxury of browsers and the global window ga tracker, for server side we will check your traits and your settings for custom dimension/metric mappings and send it with an explicit event. If you want more detailed reports on ecommerce, you might want to enable this feature. Read more about it here. Provides more detailed reports on the links clicked on your site. Read more about it in the Google support documentation. If you have Enabled Server Side Identify, you can specify the trait you want to look up for setting the event category will be since all custom metrics/dimensions for server side .identify() calls will be sent via an event hit to GA. The default value will be 'All'. For example, if you are sending traits.category, you can put ‘category’ in the setting above and we will send the value of this trait as the event category. Add any domains you want to ignore, separated by line breaks. You might use this if you want Google Analytics to ignore certain referral domains (e.g. to prevent your subdomains from showing up as referrers in your analytics). Note: this only works for Classic profiles. Universal profiles can edit their ignored referrers directly inside Google Analytics. The querystring doesn’t usually affect the content of the page in a significant way (like sorting), so we disable this by default. Because Google Analytics cannot accept arbitrary data about users or events, when you use analytics.identify(userId, traits) with custom numerical traits or analytics.track('event', properties) with custom numerical properties, you need to map those traits and properties to Google Analytics custom metrics if you want them to be sent to GA. Enter a trait or property name on the left. Choose the Google Analytics metric you want on the right. Google Analytics only accepts numbered metrics (e.g. metric3). We suggest using user-scoped metrics for trait mappings and hit-scoped metrics for properties. Contact us if you need help! Google Analytics tracks mobile apps separately, so you’ll want to create a separate Google Analytics mobile app property. Remember to only add a mobile tracking ID if you’re tracking from a mobile library. If you’re tracking from a hybrid app, fill in your website tracking ID instead. Leave it blank if you don’t have a mobile app property. Adds a noninteraction: true flag to every event tracked to Google Analytics. If you’re seeing unusually low bounce rates this will solve that issue. If you are using the server side GA integration, you can map your custom traits or properties to known measurement protocol params. This lets you study errors and exceptions in your iOS and Android apps in Google Analytics. Specifies what percentage of users should be tracked. This defaults to 100 (no users are sampled out) but large sites may need to use a lower sample rate to stay within Google Analytics processing limits as seen here. Currently only available in the browser - mobile coming soon. User-ID enables the analysis of groups of sessions across devices, using a unique and persistent ID. This only works with Google Analytics Universal. IMPORTANT: Sending email or other personally identifiable information (PII) violates Google Analytics Terms of Service. Important: When creating your Google Analytics profile, you can choose between Classic and Universal Analytics. After March 2013, new profiles default to Universal, while earlier profiles are Classic. An easy test: if you see _gaq.push in your code you’re using Classic, so enable this. Your Serverside Tracking ID is the UA code for the Google Analytics property you want to send server-side calls to. Leave it blank if you don’t have a server-side client library that you want to send data from. Remember that data tracked from mobile integrations that are not bundled in your app send data to Google Analytics server side, since Segment sends data to them via our own servers. Google Analytics allows users to either pass custom dimensions / metrics as properties of specific events or as properties for all events on a given page (or the lifetime of the global tracker object). The default Segment behavior is the latter. Any metrics / dimensions that are mapped to a given property will be set to the page and sent as properties of all subsequent events on that page. You can disable this functionality with this setting. If disabled, Segment will only pass custom dimensions / metrics as part of the payload of the event with which they are explicitly associated. Please reference the Google Analytics documentation for more info. Defines the sample size for Site Speed data collection. If you have a small number of visitors you might want to adjust the sampling to a larger rate for your site speed stats. Tracks events to Google Analytics for page method calls that have a category associated with them. E.g. page('Docs', 'Index') translates to Viewed Docs Page. Tracks events to Google Analytics for page method calls that have a name associated with them. E.g. page('Signup') translates to Viewed Signup Page. Your website’s Tracking ID is in the Tracking Info tab on the Admin Page of Google Analytics. Leave it blank if you don’t have a website property. Google’s AMP Client ID API lets you uniquely identify users who engage with your content on AMP and non-AMP pages. If you opt-in, Google Analytics will use the user’s AMP Client ID to determine that multiple site events belong to the same user when those users visit AMP pages via a Google viewer. Associating events and users provides features like user counts and session-based metrics. Enabling this feature will affect your reporting. Please carefully reference Google’s documentation for more info before you enable it.